Adjust an oven rack to the lower-middle position and heat the oven to 325 degrees. Brush the bottom and sides of a 9-inch springform pan and press evenly into the pan bottom. Bake until fragrant and beginning to brown around the edges, about 13 minutes. Cool on a wire rack while making the filling. Increase the oven temp to 500 degrees. In the bowl of a standing mixer, beat the cream cheese at medium -low speed to break up and soften it slightly, about 1 minute. Scrape the beater and the bottom and sides of the bowl well with a rubber spatula; add the salt and about half of the sugar and beat at medium-low speed until combined, about 1 minute. Scrape the bowl; beat in the remaining sugar until combined, about 1 minute. Scrape the bowl: add the sour cream, lemon juice and vanilla and beat at low speed until combined. Scrape the bowl; add the egg yolks and beat and med-low speed until thoroughly combined, about 1 minute. Scrape the bowl; add the remaining eggs, two at a time, beating until thoroughly combined, about 1 minute, scraping the bowl between additions. Brush the sides of the springform pan with the remaining 1/2 tablespoon melted butter, Set the springform pan on a rimmed baking sheet (to catch any spills if the pan leaks). 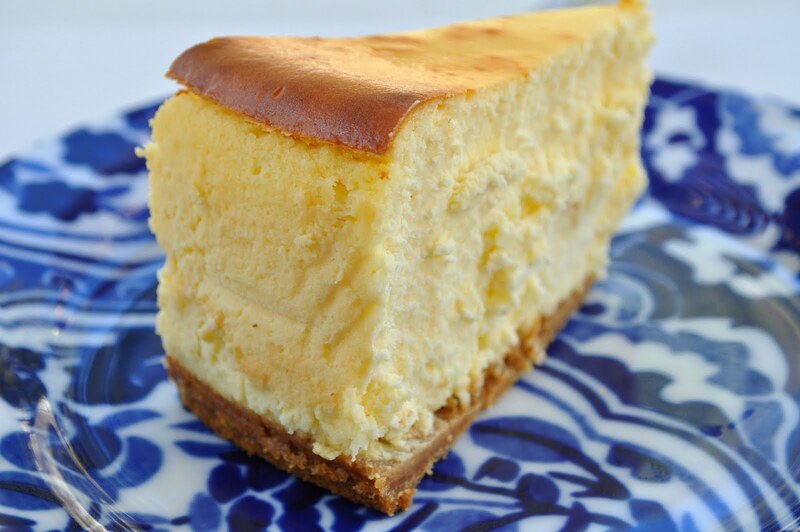 Pour the filling into the cooled crust and bake 10 minutes; without opening the the oven door, reduce the oven temperature to 200 degrees and continue to bake until the cheesecake registers about 150 degrees on and instant read thermometer inserted in the center, about 1 1/2 hours. To unmold the cheesecake, remove the sides of the pan, Slide a thin metal spatula between the crust and the bottom of the pan to loosen, then slide the cake onto a serving plate, Let the cheesecake stand at room temp about 30 minutes, then cut into wedges and serve with fresh strawberry topping if desired.